Calliope is based in Athens, in the rolling hills and woods of Southeast Ohio. We're part of a strong arts and music community, which thrives in the rich mixture of people of Appalachian heritage and more recent arrivals, many attracted to our local food economy, self-sufficiency, and rural lifestyle. Formed in 1993, Calliope grows out of the women’s music movement. “Like any political song movement, its music challenges, comforts, educates, and invites the heart to fall in love with a new perspective on life and humanity” (Holly Near). 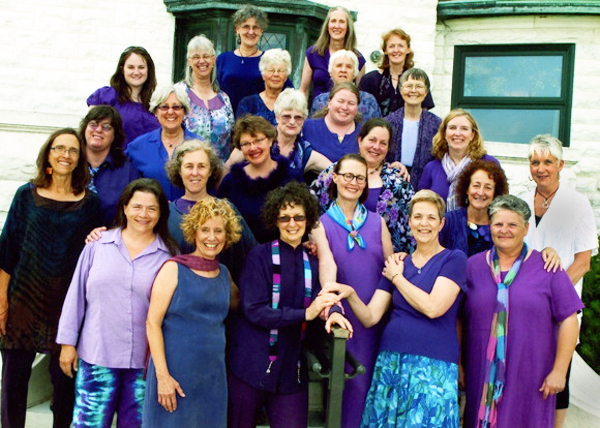 We are a member of Sister Singers’ Network, connecting us to women’s choirs around the U.S. that share our musical and social vision. We are around 40 singers, ages 12 and up. Our repertoire includes songs honoring women’s lives and composed or arranged by women. Gay/straight affinity in feminism informs our humor, our culture, and our music. We sing about peace and justice and the health of the planet. We strive for beauty in vocal production and musical expression. Since 1997, Calliope has been directed by Nancy Pierce, whose background in music and social justice work is integral to the choir’s development and identity. Calliope performs a full concert annually and sings at events in support of community organizations. Free childcare is provided for singers. We offer a sliding scale for all dues and performance tickets as part of our commitment to accessibility and inclusiveness. Calliope offers a sliding scale for dues and concert tickets as part of our commitment to accessibility and inclusiveness. Our budget includes purchasing music and music rights, venue costs, and paying our director, accompanist, guest artists, and other supporting professionals. Your support to help sustain our efforts is much appreciated anytime. Donations: Donations to Calliope Feminist Choir are welcome and are tax-deductible. Please contact us for a mailing address. Volunteers: Volunteers are needed to help with our concert receptions. Please e-mail us for more information: calliopefeministchoir [at] gmail.com. Sponsors: Concert sponsors reach 300 community-conscious supporters. We list our sponsors in our concert program on an attractive insert as a keepsake and reference for audience members.